Ingross Technologies Pvt. Ltd is a sole proprietorship based business concern, which was incorporated in the year 1988 at Ahmedabad, Gujarat. We are one of the reputed manufacturers and suppliers of a vast variety of Fire Fighting Accessories, Gas Burners, Industrial Furnace and Ovens. Our products are the first choice of various leading companies of the market due to their A-class quality standards and some dynamic features like precise designs, robust construction, long service life, smooth operations, optimum performance, anti-corrosive finish and high tensile strength. The vast array of products manufactured by us comprises Fire Sprinkler, Sintering Furnace, Natural Gas Burner, Industrial Gas Saver and many more. We customize these products for our esteemed clients as per their specific needs and requirements. Clients can avail these products from us at reasonable prices and within the given time period. We are known for associating with reliable vendors who cater raw material in accordance to the customized needs of our clients. The business activities of Universal Switchgear are led by Mr. Amit Joshi (Chairman & Managing Director (CMD)), who is a vast experienced professional. Under his guidance the production has grown by leaps and bounds. With the credulous achievements Mr Joshi has enabled to bring forth unity and new ideas to keep up the position of our company in the market. The regular training sessions has brought up the standard for the production that has been cherished widely in this domain. We have developed an outstanding infrastructural building at Ahmedabad. We have segregated the departments which are spread across a vast acre of land. These departments are resourced with all the important amenities that are needed to carry out our production in a well organized manner. Our manufacturing plant is operational with hi-tech machinery, which helps us maintain smooth supply chain in the market. Our team of qualified and specialized professionals helps us to achieve our annual sales and production targets. Our professionals work with client-centric approaches that helps us to achieve higher standards and customer satisfaction. Development of products is possible through our professionals in-depth knowledge of their respective fields. The well organized distribution network of our company enables us to deliver ordered products to the clients within the stipulated time. Manufacturing and Trading of Fire Protection Accessories. We boast of an highly qualified team that consists of superiors from various professions who have contributed majorly in this sector. With the best machines in the block, we have credulous workforce that enables free flow of the work. keeping in consideration all the norms of the market, our main focus is to cater to our clients in accordance to their need. We are certified from Thermax Ltd.
Our aim is to create an awareness and respect for the environment, by developing involvement in environmental improvement by ensuring healthy operating practices, philosophy and training. We have professionals in our team who pay special emphasis on the environment policy as it initiates responsibility towards the surrounding and its inhabitants. And, the interaction of each with the other!! Ingross Technologies Pvt. Ltd. was established in the year 1995, under the able leadership of Mr. Amit Joshi, having more than 15 years experience in the field of LPG Installations. We undertake Design, Supply, Installation & Commissioning of LPG Bullets on Turnkey basis as per SMPV (U) Rule 1981 & IS Code 6044 Part II. We undertake Design, Supply, Installation & Commissioning of LPG Bottling plant as per OISD 169 & other Petroleum Installation i.e. LSHS/FO/LDO/HSD. 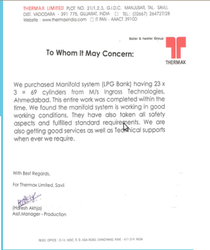 We are also approved for Multi cylinder Installation as per IS Code 6044 Part II. We are approved by all the leading Oil companies, namely Bharat Petroleum Corporation Ltd., Hindustan Petroleum Corporation Ltd., Shell Gas, and SHV holdings Super Gas (SHV) for Multi Cylinder Installation & pipeline erection.ne erection. We hold expertise in providing Multi Cylinder Installation Services to the clients. These services are rendered as per the international standards and norms as per the requirements of our clients. Owing to our rich experience of our team members, we have been able to undertake designing, supplying, installation and commissioning of LPG bullets on turnkey basis as per SMPV (U) rule 1981 & IS code 6044 part II. 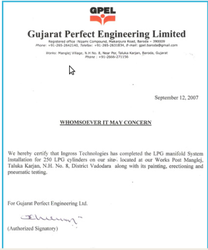 We also provide same services for LPG Bottling plant as per OISD 169 & other petroleum installation such as LSHS/FO/LDO/HSD. Our organization is also approved for multi cylinder installation in accordance with the IS code 6044 part II. Apart from this, Bharat Petroleum Corporation Ltd., Hindustan Petroleum Corporation Ltd., Shell Gas and SHV Holdings Super Gas (SHV) have approved us for multi cylinder installation & pipeline erection.